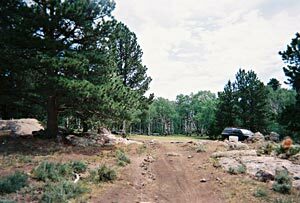 National rendezvous events and primitive mountain man camp. 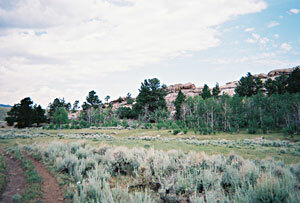 THIS IS THE SAME SITE WE ENJOYED IN 2000, A PRIVATE RANCH IN THE LARAMIE MTN. RANGE SOUTH OF DOUGLAS, WY, elev. 6700 ft. LOCATED JUST 27 MILES OF GOOD ROAD OFF OF i-25, THIS IS ABOUT AS FAR EAST AS A WESTERN RENDEZVOUS CAN GET. 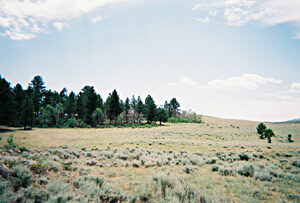 THE LAND IS SLOPING HIGH PLAINS GRASSLAND WITH A BACKDROP OF BROKEN ASPEN/PINE WOODS. 200 OR MORE CAMPS WILL FIT INTO THE WOODLINE. 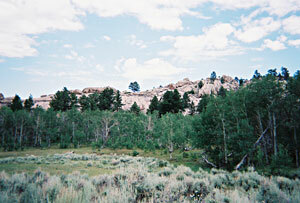 THE ERODED SANDSTONE CLIFFS OF GREY ROCKS IS A BACKDROP AND THE LARAMIE RANGE FILLS THE WESTERN SKYLINE. WE ARE PLANNING A GREAT RENDEZVOUS FOR YOU, BUT WE HAVE NOT MANAGED TO GET WEATHER CONTROL. It can be hot, cool, dry, wet, windy, calm, and on the edge of the mountains, hail, frost or snow are possible. Be prepared to be flexible.